A study published in Anesthesiology: The Journal of the American Society of Anesthesiologists, Inc., tested electroacupuncture for its effectiveness in treating persistent pain. Although the subjects used in the study were animals, the findings can be easily translated and adjusted so the same methods can be used to treat human beings. The studies showed that electroacupuncture can greatly decrease several types of pain, including neuropathic, inflammatory, cancer-related and visceral pain. 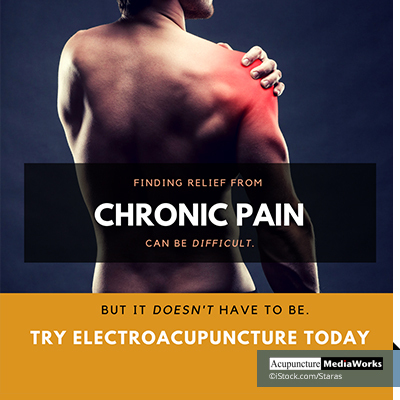 The studies showed solid evidence that electroacupuncture can indeed be used for analgesia in patients that are suffering from chronic pain, regardless of the type of pain. Acupuncture is a modality used in Traditional Chinese Medicine (TCM) in which a practitioner inserts hair-thin, solid, stainless steel needles into the body, under the skin along energetic pathways. These energetic pathways, or meridians, are invisible lines that run throughout the body. These meridians allow energy or Qi (pronounced “chee”) to flow throughout the body, keeping the body in balance and alignment. For optimal health to be achieved, Qi must flow freely without any blockages. Blocked or stagnant energy can result in disease or decreased vitality. Electroacupuncture is a variation on acupuncture. Electroacupuncture works the same way as regular acupuncture, but it uses the needles as conduits that administer small jolts of electricity that invigorate the skin and muscles of the body. Electricity increases the effects of acupuncture. This can lead to increased energy, pain relief, and much, much more. The electrical charges encourage additional physiological processes that go beyond the mere stimulation of Qi. Acupuncture coupled with electricity, encourages the body to release neurotransmitters that can act as natural painkillers. Because of this, electroacupuncture is becoming more common in the treatment of pain. Electroacupuncture is especially useful for conditions in which there is an accumulation of Qi, such as chronic pain. This type of acupuncture can be used as a pain reliever for muscle spasms, neurological disorders and possibly even heart disease. There is evidence that electrical stimulation of acupressure points can activate the endorphin system. This can actually lower blood pressure and decrease the risk of heart disease. Electroacupuncture produces a rhythmic, non-painful muscle twitch just below the needle through the use of a very small milliamp current. This stimulation triggers perfusion of blood flow locally. This blood flow carries essential nutrients that promote muscle regeneration. The use of electroacupuncture can break pain cycles, while smoothing the way for a person’s own pain-relieving mechanisms. Electroacupuncture also relaxes muscles. Electroacupuncture does come with risks and it is not appropriate for everybody. Anybody who has a history of seizures or epilepsy would not be an ideal candidate for the use of electroacupuncture. Also, it is not recommended for people who have pacemakers, as it can interfere with the electrical current of the devices. Before trying electroacupuncture, the practitioner should verify that you are not at risk. If they do not, it is vital for the patient to bring this up to avoid any complications.